The next train station to the Wewelsburg is Paderborn Hbf. From here the bus route 460 runs hourly to Büren-Wewelsburg. The Wewelsburg is located near the motorways A 44 and A 33. Please follow the signposts. The bus route 460 runs hourly from the Paderborn main station (direction airport) to Büren-Wewelsburg. The Wewelsburg is a Renaissance castle with a triangular layout – three round towers connected by massive walls. The castle (built from 1603 to 1609) can look back on an eventful history. From 1934 to 1945, the castle was used of Hitler's murderous SS under Heinrich Himmler and partially redesigned. The construction measures of the SS – despite the rather vague content ideas – reached considerable proportions. In the early years, the Wewelsburg castle received a completely new interior, which was decorated in part with SS ornaments. In March 1945, Himmler ordered the demolition of the castle and the adjacent administration building. The Wewelsburg has burned completely down and then was rebuilt directly after the war. Today, the historical Museum of the bishopric of Paderborn (Historisches Museum des Hochstifts Paderborn) and a youth hostel are accommodated in the Wewelsburg. The youth hostel is one of the largest in Germany. The former SS guard building at the forecourt of the castle houses changed it´s face drastically and became a museum the 'Erinnerungs- und Gedenkstätte Wewelsburg 1933–1945'. A memorial site that addresses aspects of Germanies dark history and therefor preserves it for future generations. Today it is the world's only comprehensive museum presentation of the history of the Schutzstaffel (SS) of the NSDAP, commonly known in English as the "Nazi Party". Guided tours are available by appointment (also in English). After the tour of the exhibition, there is the possibility to take part in a guided tour of the village Wewelsburg. The trail leads to the former concentration camp site and other buildings and places where the Nazis have left their mark. The little town Büren and the surrounding areas offer various possibilities of leisure activities. Two should be specially highlighted: hiking and cycling. Hiking in Büren means "experiencing nature – discover culture"! Who wanders in the 'Bürener Land' through the picturesque Alme - and Aftetal (valley), has the unique opportunity to meet cultural and historical sights and a lively and unspoiled nature. Over 250 km of marked hiking trails, show hikers the most beautiful routes through the wonderful 'Bürener Land' and combine nature and culture in a stunning way. In Büren, there are two regionally famous spirits, the 'Bürener Ratstropfen', which can be described as herb and the 'Bürener Moritzbrand', a fruit brandy with cumin, which is dedicated to the last Bürener stainless Lords. This hotel is conveniently situated between Paderborn/ Lippstadt and the town of Paderborn, both of which can be reached in about 10 minutes by car. Quietly located in Büren, this country-style guest house provides free Wi-Fi and a beer garden. 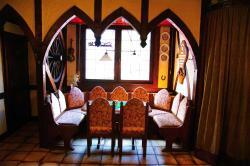 Gasthof Zunft – Stube also offers guests a restaurant and a bar packed with traditional decor.